I wrote it in the pouring rain on a Scottish riverbank, while my husband was fishing. I was covered in citronella oil to ward off the clouds of midges, and it just appeared almost fully formed in my head. Luckily I had a pen. It took me all of 10 minutes to scribble down. I wish all books were this easy to write, but I fear that this will probably be a one-off record in the quick writing stakes! 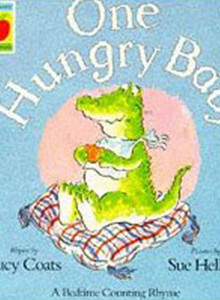 When my own ‘hungry baby’ was born (after it was published), I had huge pleasure in reading it to him, and even more pleasure in the fact that he actually enjoyed it and kept asking for it again and again. He’s been my best critic ever since. Sadly out-of-print, but can still be found in secondhand bookstores, and at AbeBooks. Reviews: April 1992 selected by Sunday Telegraph in ‘best of recent children’s books’ list.